What could be more tempting than a creamy shake made from Soft Serve Ice Cream. Choose your flavour from Raspberry, Milk Chocolate, White Chocolate, Banana or how about an Espresso Shake made from our coffee and topped with some whipped cream perhaps! how about you create your own ice cream dessert? We start with either a Sugar Ring Doughnut, a squidgy Chocolate Brownie, a freshly baked chewy Cookie or a delicious Belgium Butter Waffle. Or just a large tub of Soft Scoop Ice Cream! Then we add the Ice Cream, after that we have the choice of syrups and sauces and then your favourite 'sprinkles' topping! 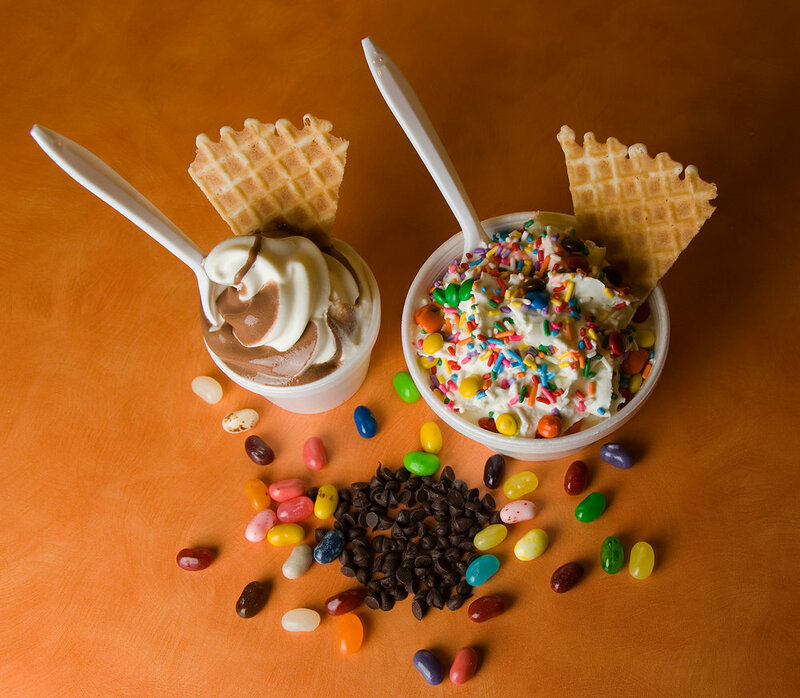 Obviously, if you wish to build it up with lots of different toppings we can do that too! ... perfectly roasted to make your choice of coffee. Chose from our variety of Maison Routin syrups to create your favourite drink! Canton Tea provide our tea bags and herbal infusions. The tea is bought fresh each season direct from small farms. They have been slow grown, skilfully picked and lovingly handcrafted. The tea is not bought from large intensively farmed tea estates. Many of the traditional teas are beyond organic – and biodynamic. Some are from tea farms abandoned many years ago with trees allowed to grow untamed, others are from wild native trees in the forests of Yunnan. Our Ecuador 71% Hot Chocolate Melt is made of Nacional beans, native to Ecuador, which deliver a surprisingly gentle flavour with soft and subtle aromas suggestive of flowers and raisins. We serve it simply with steamed foamed milk, nothing added. Of course, you can personalise your drink by adding syrup or even whipped cream, marshmallows and perhaps a flake! Delicious Pastries, Doughnuts, Cookies, Chocolate Brownies and other treats to accompany your hot drink!